Ok, it’s been a couple of weeks and I’m still reviewing the ACS. It’s all good, right? I mean, what else do we have to write about in cheese land? I’m going to first review a bunch of cheeses that I liked a lot but did not vote for in the Best of Show. Then I’ll discuss which ones I voted for and which ones won. You with me? Ok, in the soft-ripened categories I had two favorites. I’m always so happy when I’m into a cheese that I’ve never tasted or seen before. It makes it so obvious that there are so many good cheeses in the country (and world) that I still have yet to try. It kinda gives you hope about everything, ya know? I had tasted neither of these before last month. The first was in my judging category of “flavor-added, soft-ripened”. Isn’t it pretty? I wish I had known about them when I visited Maine a few years ago, I would have loved to visit. The Soeur Angele is a mix of goat and cow with added cream. Not a strong cheese, but a perfectly ripened and tasty wheel. 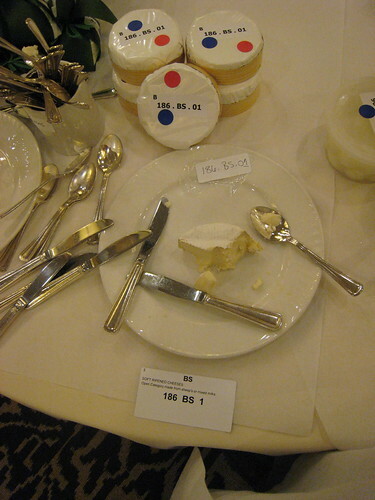 Makes me hope I can go to Montreal for next year’s ACS and try all those Canadian cheeses we never get here. 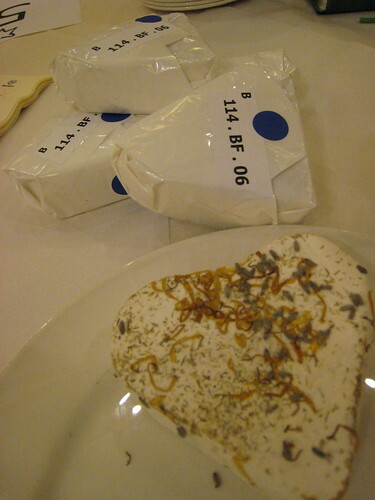 This entry was posted in Uncategorized and tagged acs 2010, acs favorites, american cheese society favorites. Bookmark the permalink. Meow, the cheese from Appleton Creamery looks amazing. Keep the ACS reports comin’!